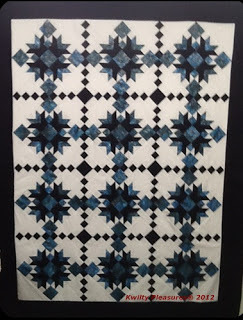 in the 2012 Christmas Quilt Show. Thanks Michelle, for coordinating this effort! It is another great way to share our creative spirit! "12 Days of Decking My Halls"
Sign up as a follower so you don't miss a post! What does a Christmas tree say about you? Are the trees links to your past? Do they represent a passion, a hobby, theme? White lights or multi-color lights? Do you have one tree or many? in my home during any one Christmas season. I'm the gal who takes a week of vacation to deck my halls! my holiday creations with YOU! 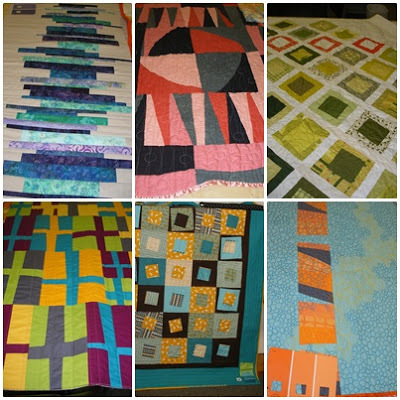 HOLIDAY QUILTS ! ! ! It will be a Kwilty Pleasures Christmas from me to you!! A quilt full of presents seems a perfect way to begin. My BFF, Shirley, and I have been friends since 3rd grade. "A Friend is a Present You Give Yourself"
Holiday Lane Pillow "Giveaway"on Saturday! You still have time to enter. "Follow me"
over here and leave me a comment for that contest! 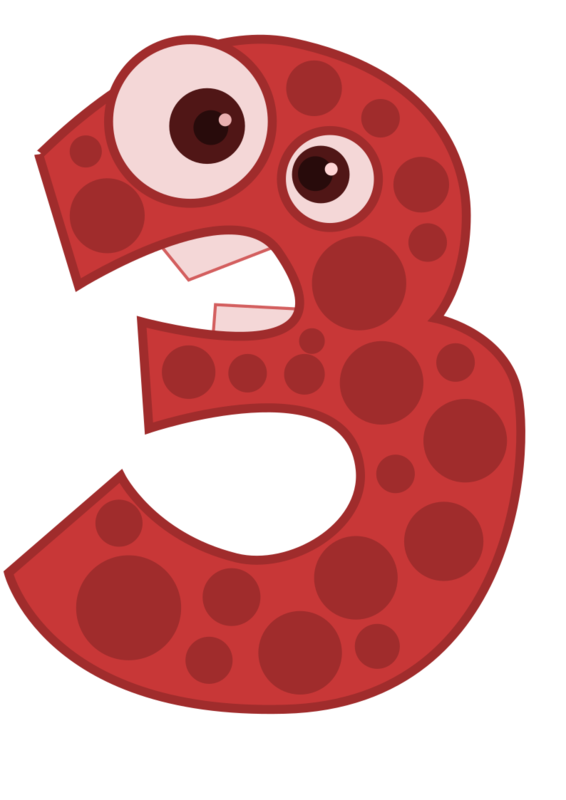 Sunday Snippet - A week of numbers! My week was all about numbers! that doesn't include those of you who follow by email. 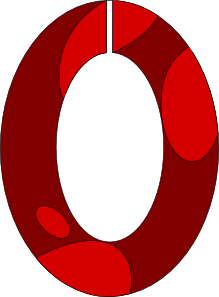 For me and my blog...it is a milestone. I appreciate each of you..thank you! I won 2 give away prizes this week while blog hopping. And "pinsies" from Karen at the Selvedge blog. Proof positive that persistence on entering give away...works! I finally felt like sewing so I pieced 3 baby/toddler quilt tops. my Bernina, was so happy to be stitching away. 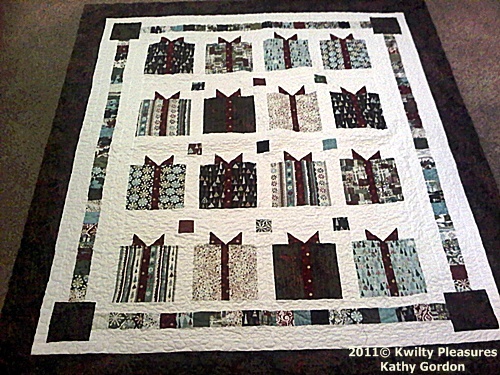 Kwilty Pleasures was a stop on Madam Samm's Holiday Lane Pillow blog hop this week. If you missed it...hop here and take a peek. Still time to enter the give away for this Moda Charm Pack! Charms and Rectangles for this one! I have slowly and I mean SLOWLY started my holiday decorating. THE BAD NEWS is because of my foot surgery I am not putting up all the themed trees and vignettes I usually do. I have written "12 Days of Decking my Halls" posts. work for your holiday decorating. 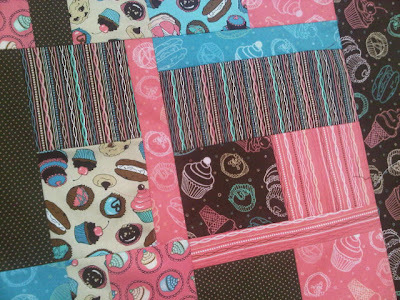 I just signed up to be a part of a Blog Hop Party sponsored by quiltinggallery.com that will begin on December 10th! meet new bloggers, find creative ideas, enter contests. SLOW down during the holiday madness and just hop! But the highlight of my Kwilty Pleasures for the week! I am so proud to be a Buckeye! Sew, any numbers turn up in your week? Anyone up for a PILLOW fight? Start here and "follow me" down my Holiday Lane! a chance to win my GIVE-AWAY. A Moda "Ready, Set, Snow" 42 pack of charms! For my pillow, I pulled all the fun fabrics from my Christmas stash! I don't do much applique...so this was a challenge. Perfect pillow on the bed in my guest room. the pillow is stuffed with left over scraps of batting. keep it from sliding off the rooftops! And look...the background fabric looks like it is snowing! the glass beads used as white lights along the rooftops. And here is a close up of the embroidered chimney smoke. And there you have it..my Holiday Lane Pillow. You have chances to win the Moda 42 charm pack ! and/or tell me if you have been in a pillow fight. ...give me the FUN feathery details! ARE YOU A NO REPLY BLOGGER? and check the email box so I can see your email address. OR leave your email in your comment box. and you loose out on blog contests. the other Holiday Lanes today. Rest your weary head upon all the lovely pillows. Sew Mollie Sue, Quilt Much? Many thanks to Pauline, Quilt N Queen, for all the snowballs thrown to keep us tracking down Holiday Lane! To Madame Samm at Sew We Quilt for yet another fun hop. And to Jill for providing the pillow pattern. May your next Kwilty Pleasure be a PILLOW-FIGHT! Paint Chips..not just for wall paint anymore! on how to use paint chips for your next creative outburst! I organized and/or participated in. Basic rules are set by the Challenge Coordinator. to the "paint chip colors"
Include something to "tie" the challenge together. Participants draw an envelope and the fun begins. Why not charge participants a small entry fee or run a food drive. Have some fun with the challenge AND help your community. Here are my finished Paint Chip Challenge projects. I added pink and gold to the green paint chip colors. Echo quilting was the right choice here. Added some beads to spiff it up a bit. This challenge needed a "hand" applique n the design. 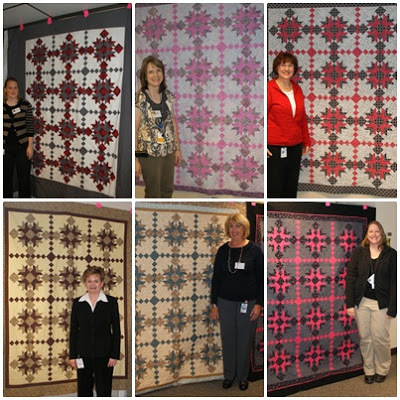 BTW - this was my first "art quilt" and my design. All entries in this challenge had to have the same "leaf" applique. Sparkly yard provided dimension for the flower's center. Echo quilting around the flower and meandering on the border. This was my 2nd "Art Quilt"
My most recent challenge had a WONKY twist to it. Challenges are fun and always get those creative juices flowing! If you belong to a quilting group why not give a "Paint Chip Challenge" a Kwilty Pleasures try. which traditionally kicks off Holiday Shopping. and will be used by all hop stops. So Many Holiday Lanes - So Little Time! 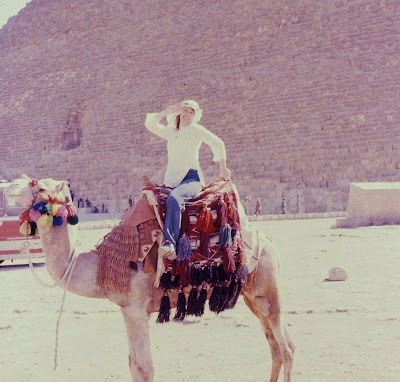 Sunday Snippet - A Mystery of Wonky! every other month the participants received a "clue". be cutting and how to sew them into the units. for tools that would help the quilter make the blocks! I wanted this to be a SUCCESS! see what the finished top would look like. here it is my finished quilt top. was a huge success. Here are some of my favorites! to a Paint Chip Challenge. from the local big box hardware store. pulled from my stash for this challenge. had to have a WONKY theme. And some of my WONKY FAVORITES! in your own guild or quilting group. I made a WONKY pillow! To go with this quilt I made some time ago. Gemma was 15 months old when I finally got to meet her. Cupcake is a key word as I describe that meeting. the party and ate the "cupcakes" like I wish I could! What is that in her hand? 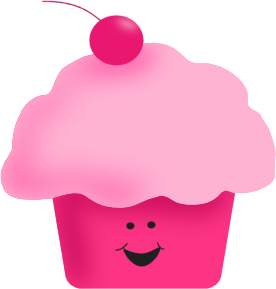 Looks like a "cupcake"!!! It is large enough for her to use for several years. A simple meander quilting on my Bernina ! from my stash. I love this back! I'll get to wrap her up in it when I babysit! I would meet so many WICKED bloggers in just a few short days. Your kindness and comments would lift my spirits higher than a witch flying past a full moon! I would end up with sew many new "stalkers". #12 would be the lucky winner of the mug rug. #12 would also be a "new follower" and that person is JoyceLM and here is her comment. Thanks for sharing your great tutorial - I have to make this. And thanks for the giveaway. I'm a new follower. Joyce I have sent you an email so I can get your mailing address! 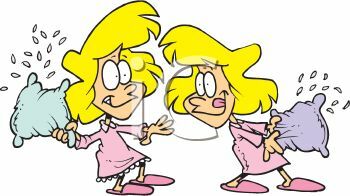 I am so thrilled that Wendy invited Kwilty Pleaasures to be a blog stop, a FIRST! And what about the Great Madam Samm...OZ has nothing on you my dear! I know everyone has a memory of their "favorite"
November is a month to give thanks for all our blessings. to reflect on how this 1st day of November began for me. an entertaining story about my journey of Thankfulness. I am "thankful" I have new blogging friends! here is an autumn batik quilt I made last year! I'm snuggled under it right now. and a fascia muscle release. but can only repair one foot at a time. finding a new doctor, an MRI, a nerve conduction. 6 weeks of physical therapy, steroids and pain inhibitors. I am "thankful" for Dr. Berlet. taking a barefoot walk on the beach for 1/2 hour each day. the muscles in feet and legs differently. Who knew? If you walk the beach please wear proper shoes. I am "thankful" for the beach! I am thankful for "wine" at the beach. "What about all that dancing you used to do". ever sat down-given the chance to dance. I am thankful for all the fun I had dancing with my friends! And now for the entertainment I promised. director of an ethnic dance troupe. this is me on a camel in front of the Giza pyramids. 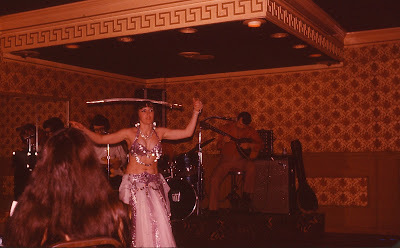 Raheja (me) was a featured "belly dancer"
Columbus Ohio for many years. I also danced in other cities, states as well. I am thankful for the Agean and Fisherman's Wharf! be taking a toll my 60 year old feet. such joy to others and to my heart, soul and creative spirit! to my every need or whimper! to share a love that is second to none. I got it "right"
with Mr. Right, this time...my soul mate. 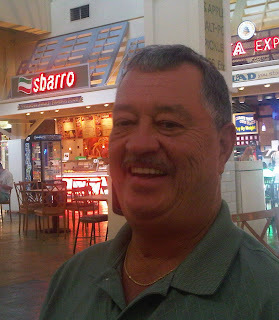 I am "thankful" for Phil Gordon...the love of my life. but my best pleasure "to have and to hold"! Tell me something your are thankful for. See the tab above for my Privacy Policies. I am one GHASTLIE chick!